This book is designed for those interested in encouraging and nurturing creative awareness, attitudes and accomplishments in themselves and others. It blends expanded imagery and analogy processes with the Osborn-Parnes Creative Problem Solving (CPS) process. It also features and integrates researched and time-tested instructional materials from earlier publications. 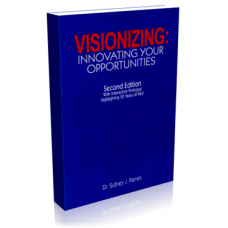 Visionizing makes explicit and expands the "opportunity-finding" processes which are largely implicit in general CPS programs -- what is termed in the Osborn-Parnes model, "sensitivity to objectives or messes." It greatly expands upon "the front end of the CPS process." This second edition summarizes significant new enrichments the author has been making in Creative Problem Solving in recent years. It also explains CPS's relationship to Visionizing. The foreword and short preface provide insight into how the past 50 years of research and development enabled the constant growth and revisions of the CPS program. The material in Part II is presented unchanged from the original edition, as much as it shows exactly how the original courses were presented and modified as more was learned over the decades.